CATCH FLANFIRE AT AN ALL-NEW LOCATION! My good friend Jonny Sanchez (who tunes my piano!) I first met as a founding member of Future Clouds and Radar -- and about the time the Summer Wardrobe's first record was being released. Recently I saw Robert (with Darin Murphy at the Mohawk) and Jonny (old FC&R photo from Ego's) playing on the same night for the first time in years -- but of course at different venues! Both of these creative guys have new records out with their bands, so it only makes sense to review both at the same time. There may be little more to say about the FC&R record, given the amazing writeup for the band in a recent Austin Chronicle -- but suffice it for me to say that Robert initially brought together a bunch of highly talented individual players and just let them grow into their roles in this band such that the sound has evolved organically over time. When Jonny left to focus on the Wardrobe, Robert just took over the lead guitar work. Josh Gravelin has given way to Joshua Zarbo who seems to have a light turned on as he plays his lines. Murphy took a brief leave of absence (I recall one night seeing Nina Singh on drums) but is back with his great voice and steady beat -- and the beautiful (and preggers) Hollie Thomas continues to bring that same mystique to the keyboards that I recall from her Halloween performance at the American Legion Hall a couple of years ago. Kullen Fuchs shows up when he can to add ambience (that is, trumpet, various keyboards, accordian, and whatever fits the mood). To the fray. On the surface, the lyrics here speak of mortality -- the Chronicle's Austin Powell says the album brings "into question the worthiness of mortal accomplishment and mainstream acceptance." He also shows us a possible why -- Harrison's break from live music after the demis of his former band Cotton Mather. How can you live when your music, your very soul, is smothered or, worse, ignored? What makes your life worthwhile -- the recognition by others of your contribution, or is the experience of co-creating with the Eternal One enough? "The Epcot View" -- "this dream's a self-made light show where some dark prince shall exhort us into battle licking the bones of his very last foe..." We are talking here again about the thane of transcendentalism whose house studio (the Star Apple Kingdom, same as the record label) is Harrison's version of Walden Pond. Old Edmund Ruffin is a real historical figure -- an ardent supporter of secession who took his own life after the war ended. Harrison grew up in Alabama (aka the Heart of Dixie) ... at a time when the longing for the Old South was still passionate. Or, in other words, if the product of our life is meaningless (or even negative? ), what then do we do next? Thankfully, Robert's answer was to get up and get going again. And why not? "Feet on Grass" suggests that, "they're gonna round us up and embezzle the loot, throw every model citizen under the jackboot -- and they'll shoot!" [Can anyone say, Ohio National Guard?] You have to resist the death culture! "Mummified" is a powerful description of the frustration of creation not recognized -- "beneath the ground, but I'm alive, I see you and I'm mummified." And, yes the music has an Egyptian flavor. "18 Months" continues the theme -- "I spent 18 months buried alive...." But the energy has returned, and you know we are talking past tense .. as he urges us to "feel my breath, join my fight." Anyone thinking of giving up? Play this record and dance all night to it -- this is good therapy. The anti-Jim Morrison. "The Mortal" is a warning -- "the bereaved were so praised that idols were made and we all crawled like dogs straight from cradle to grave." Rather, we should "let each kingdom crumble until the one will shall be done .. that's the work, that's the real work." And the music here is a solemn march -- that extends into track 7. "Follow the Crane" is Robert talking to himself, "You're back. You took a break, follow me down right past the world right to here, a home where love can never sleep." And so he did -- and we are all enriched by that journey. Now I got down to the Saxon for the band's CD release party and saw them again this week (without Kullen) at the Mohawk. Both sets were awesome -- and the band opened for Alejandro Escovedo at Antone's this week as well. Lots of songs from the double album from two years back that was so well received -- and I still kick myself for missing the show with the Tosca strings and East Side Horns and who knows what all else (at the Parish). Whenever you need to get outside the drudgery of everyday and remember your dreams, go see Future Clouds and Radar -- and tip the band extra well. They are MUCH cheaper than your shrink! Hidden in the crevices of the CD jacket to Cajun Prairie Fire is a tall tale of the Cajun Ocotillo Sundown and his travails and travels out west from the land of crawfish. There is real truth somewhere within these stories, and yet the discovery is less important than the music itself. Jonny Sanchez and his bandmates -- Marty Hobratschk (bass), George Duron (drums), and John Leon (pedal steel) once again have brought joy to the hearts of their fans with eight songs straight from Jonny's own journey [including a well placed cover of Roky Erickson's "Mine, Mine Mind"]. Mark Addison is also back as producer, and on occasion live (as for example at Lovejoy's one fine October night) one might find Kullen Fuchs or Claire Hamilton joining the band to liven up the sets. I have even see Addison himself on stage (at a most memorable show at Ruta Maya when Leon was otherwise engaged). The combination of Sanchez's own guitar virtuosity and Leon's flexibility on the pedal steel join to create a unique sound -- with lots of reverb, lots of crescendos, and lots of bravado. Now the band has been playing most of these songs for quite a while -- and so for me the CD itself has some familiarity. But this music just does not get boring -- or old. I mean - "Baby Let's Switch Graves" and "When You Died" -- this is after all an imagination up there with that of the afore-mentioned Robert Harrison. And just as serious a guy underneath it all. Every Wardrobe show is a blast -- and one may wonder whence the lion and the witch. "Highs in the Mid-90's" IS new for me -- gritty and rough, with the line "good wasn't good enough" to get us thinking. Over six minutes long, much of which is blazing guitar! "Ocotillo Sundown" is as smooth as silk, with lots of pedal steel, as Jonny sings that "everything revolves around the hammer and the sickle" (see liner notes). "Cajun Prairie Fire" is luscious, psychedelic music, with Duron's drums creating lots of space for the twin leads -- and what leads! "Is this a dream? Is this a lie? (followed by another one)? Is this the end?" Gotta quickly mention the artwork on the jacket -- by Victoria Renard (who also took the photos for the band). Lots of symbolism -- some palm reading notes included. "Graves" is like New Wave power pop with a driving beat and very singable lines that you can dance to (while switching graves, what better than to dance on them?). I think David Bowie would want to cover this one. "Venus of the Merchant Marine" is also new to me -- starts off as a march (amazing how both these bands are feeding off the same themes while being so distinctly different at the same time). Lots of power chords make this a very rich number -- with a pungent lead line as the chorus (who needs words?). I am thinking velvet cream cake. With sorbet or better yet, gelato. And espresso. And moonlight. The subtle shift into "When You Died" leads to an opening shocking statement -- just who are we talking with here? By this time, of course, who cares what Jonny is singing about -- you are so mesmerized by the music. But then again it IS Elevators music -- 6-1/2 minutes of pure acid rock. And after all, Jonny and the guys DID serve as Roky's backing band for the past year or so (including last Halloween in Hollywood). "One Longtime Feeling" opens with Jonny on acoustic guitar and nothing else, adds quiet drums, and then the pedal steel (and a subtle bass) -- this is the song with the best connection to Sparkle and Fade and the feel of the band's debut CD. You will have to buy the CD and read the liner notes (sorry, guys, downloading will just not do!) to get the band's own take on this song and its relationship to the saga of Ocotillo Sundown the Cajun revolutionary ... but all the clues are in the song itself and its impact on our souls. Okay -- with these two fun recordings finally reviewed, I can mention a few of the shows I have seen of late -- not including the amazing sets from Drew Smith and Suzanna Choffel at Lambert's on Friday the 21st (more on those next time). I hardly remember the order of things here, but let's start with Carrie Elkin, whom I ran into at the Hilary York Revue at the Continental a week or so back. Carrie brought pals Robby Hecht (with guitar) and Danny Schmidt to join her onstage with Mark Addison and Mark Williams at Momos -- it was great fun. 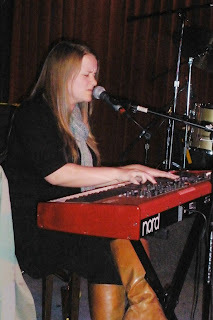 Then there was this Saturday at Momos when I actually went to see Warren Hood -- and found out he has been fortunate enough to win the services of Corey Keller on drums and the amazing Emily Gimble (Johnny's granddaughter) on keyboard and super vocals. Emily has been playing with the Marshall Ford Swing Band of late -- but from the first time I heard her sing I was hooked! Willie Pipkin blew me away with his guitar licks, and Nate Rowe was solid as ever, as was sax player Jon Doyle. Earlier that same evening I had been at the Amsterdam Cafe (I love this venue!) to see Elizabeth Wills (left) and HER band and my good Kiwi friend Jackie Bristow -- and both women were just fantastic! Jackie, who lived for years in Sydney and for a time in Lost Angels, just relocated to Austin and has already played the One World Theatre twice! She's top notch -- and fun, too! Elizabeth was on the bill for the ACL Fest this year and decided that Austin was a nice town to live in even if you are on the road a lot (as she certainly is). I COULD post yet another photo of Dustin Welch, but why -- when instead we get his lovely sister Savannah and the cutest couple on stage together in Austin, Joe Beckham and Trisha Kiefer. And, yes, that IS Rob Hooper on drums (and of course joining Dustin in song was the effervescent Andrew Smith). This was the very first show I have heard with the Continental's vaunted new sound system -- and I will wait awhile to share any opinion, knowing how hard it is to tweak a room with old toys, much less new ones. Another Thursday, another great night of music. First off was a quick stop at Austin Java for the songwriter showcase run by Jim Patton and Sherry Brokus -- here's Patterson Barrett with Julieann Banks on bass. Every third Thursday -- and the December lineup is always amazing! Then it was over to Momos to catch the wonderful Will T. Massey with his all-star band -- Richard Bowden on fiddle, Marvin Dykhuis on acoustic guitar, Mark Addison on bass, and the extremely gifted Mike Meadows on percussion -- plus a couple of visits on stage from Sally Allen (whose own debut Austin record, produced by her handsome hubby, should be out early in 2009). And as I said, I later that evening migrated down to the Mohawk -- and you know the rest. I got to know Hilary York when she and Aimee Bobruk were hosting a songwriter showcase at the Scoot Inn. I have seen Hilary and her sultry alto voice numerous times -- and have never been disappointed. But I had NEVER seen this blonde bombshell with a full band until last week at the Continental Club at a show she put together that also included sets from Claire Hamilton and The Breathers and Li'l Cap'n Travis. It is little wonder that Hilary (playing duos with the likes of Joe Reyes and Kullen Fuchs) has been such a hit at the Driscoll -- she's Julie London all over again. [Wikipedia describes London's voice as "slow, smoky, and sensual," and Hilary too is as gorgeous as that World War II pinup girl!] Her last record, "The Moon," was done in part in San Antonio with that nefarious bunch of characters known as Buttercup [and in part in Austin with the equally nefarious Mark Addison the star maker]. At the Continental, her band included Fuchs (on Wurlitzer and trumpet), Reyes on lead guitar, Zachary Firnhaber on bass, Clay Fain on drums, and the wonderful Julie Lowery (whose band The Service Industry has a CD release at Emo's on November 28th) on harmony vocals. The truth is I was having too much fun to write down anything about the set list, but it is impossible to forget "Parlour Tricks" The party level jumped up considerably when Hilary's go-go dancers jumped up on the stage (see photo) -- and yet the highlight of the evening may have been later when Jeff Johnston and Li'l Cap'n Travis encouraged Hilary (and Kullen) to join in on "Wichita Lineman." Hilary was simply radiant .. we MUST have MORE of Hilary with a full band. As for the Breathers, my introduction to Claire Hamilton was through Eldridge Goins, who produced the band's 2003 album, "Work and Sleep." But that was with an entirely different band (Landis Armstrong on guitar, for example) -- these days Claire has the Gary Newcomb Trio (with Billy Doughty and Brandon Gonzalez) with Gary playing his Fender, not his pedal steel -- and blowing away an audience full of guitar players. 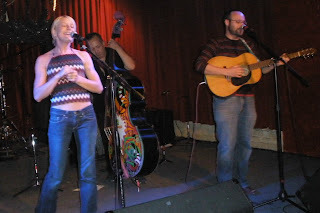 Claire and the boys did songs from their 2006 CD, "I'm Still Curious," and some newer songs, including my favorites "One Is One" and "1,000 Million." Good Grief! PLEASE play more gigs and get some new product out! I have to mention Blues Mafia, playing in the wind at Nuno's North (just look at Sasha's hair! ), getting ready for their Ireland trip, and the B Sterling Band, with some new members, rocking the house at the Carousel. Mister Archer may be the tallest lead singer in Austin since Luke Axtell -- but there are OTHER reasons to look up to him. 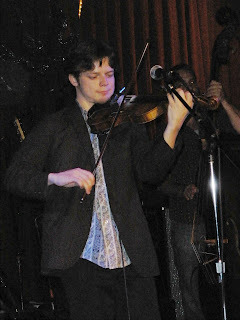 I also got out to the Hole in the Wall the other night for Leo Rondeau -- who FINALLY has a fiddle in his band! And it's not Missy Beth (shown here with Izzy Cox, with whom she will be playing some shows at the Carousel and at Beerland on November 18th). What a hoot THAT will be -- the queen of the murder ballad joined with Alaska's gift to fun and frolic! Austin Pops: Great for Moms Too! I owe a HUGE debt to my pal Ulrich Ellison (shown here with electric guitar) for turning me onto a ticket to the Austin Pops concert at River Bend Center that also featured (Sir) John Mills, Ruby Jane Smith, Leah Zeger, and the rest of the great orchestra that founder and conductor Jamie Desautels has put together (including Chris Maresh on electric bass). This was also my very first visit to the Riverbend Center -- one of the finest venues I have seen in years. Just WOW! [Okay -- it is a LONG way down from the entrance to the front row.] The acoustics are amazing, and of course the stage backdrop is stunning. This "In the Mix" show, which featured original songs from Mills, Ellison (the debut of Glorious Heights), and Zeger and Desautels (Just in Time and Can't Go Wrong) plus arrangements of classics Layla and November Rain and a bunch more. Note that Leah did not even bring her violin/fiddle to Riverbend -- this is a photo taken at a Hudsons show a week earlier (see below). Austin is SO blessed with young, beautiful jazz/pop singers, but Leah may be the only one who has a degree in opera performance -- and who can play a mean fiddle too! Ruby Jane's four-song set (yes, our girl now has a pretty dress as she nears her 14th birthday) had her jousting with orchestra soloists and (as usual) getting the audience involved. The (Texas-born) Mississippi Fiddler jammed with concertmaster Shana Bey (shown above with Ellison) on "Carroll County Rag" as her jazz fiddle teacher Martin Norgaard looked on from his Violin II post; she got the horn section involved (especially Ron Wilkins on the tuba, Mills, and trumpeter Rich Haering), and kept Maresh, Ellison, drummer Rob Casaneau (like Desautels, a native Canadian), and percussionist Laura Mordecai (whose hubby Mike is also in the ensemble) busy with numbers from Bob Wills, Hank Williams, and Johnny Cash. The Austin Pops has two more shows this season in its "Live Music Legacy" series -- on February 7 (Newbies and Oldies, featuring Daniel Stokes of the Flatcar Rattlers) and May 23 (Fiddles & Folk, featuring Phoebe Hunt). Check out their website for updates - and if you have a few bucks, get out to a show sometime. I did I did also see Leah with Hudson Mueller and Brian Hudson the night before Halloween (hence the Hudsons' amazing outfits); Aaron Starr aided on harmonica and vocals on a couple of songs and later demonstrated another of his many talents. That same evening I got out to Lambert's to see New Zealander Jackie Bristow (who is living here for the next 6 months or so) and Australian Kara Grainger (one of my very favorite people anywhere). I felt really bad that the "best" Kara could do for a band was Chris Maresh (there he is again!) 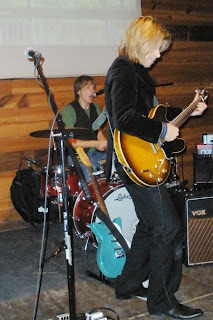 on bass, Brian Austin on drums, and Jake Andrews on guitar (sharing licks with Kara who is hardly a slouch!). I could have posted action shots but opted to show just how much Jackie and Kara enjoyed the boys in the band -- especially when Chris sang "Diamonds." For the REAL Halloween, I was very fortunate to get out to the Compound (E. 4th Street) to celebrate All Hallows Even with T-Bird and the Breaks, who all showed up as hobos in contrast to their normally suave attire. Phoebe and Stephanie Hunt were all decked out as orange flowers, and there were costumes all around. Amazingly, Alaska Governor Sarah Palin (!?) showed up to promote her appearance on Saturday Night Live. There were to be prizes for the best costumes but I cut out a little early and did not find out who won -- my vote would have gone to Fidel Castro (no photo for security reasons!) and the Zombie Bride! Late Friday, I stopped by Ringside at Sullivans (which oddly closed up at midnight?) to catch a set and a half from Wendy Colonna and her fabulous band -- Chad Hot Rod Pope on guitar, Dave (beardless) Madden on piano, Leslie McCurdy on bass, and Brandon DeMaris on drums. Wendy and the boys really had the crowd going -- and then Ginger Leigh showed up, and it was Ladies Night until the manager unexpectedly pulled the plug. Ginger has a great new video out promoting her nomination for the position of Texas State Musician (currently Shelley King) -- check it out at her site, www.gleigh.com . All great music -- and yet my PERSONAL favorite night of the past two or three months had to be last Thursday (when I forgot my camera and thus have NO photos to share). Started off with half a set at Flipnotics from the Fundamentalists (all five members on one little stage!) -- that's Brennen Leigh, Silas Lowe and company. Then it was over to the Saxon Pub to catch MOST of Sunny Sweeney's wonderful set -- gotta love that woman, AND her new guitarist Cole Rich (and yes, he is kinfolk to Charlie Rich). But all that was just the warmup for the rest of the night! A CD release from Robert Harrison and Future Clouds and Radar (with Hollie Thomas, Darin Murphy, Kullen Fuchs, and Joshua Zarbo) -- and a great set at the Saxon. THEN, thanks to a beautiful, mysterious redhead, I motorvated over to Lovejoys to catch a set (and a new CD) from the Summer Wardrobe -- and got an even MORE unexpected bonus -- Sally Crewe and the Sudden Moves, compleat with appearances from Sally's folks -- all the way from England -- and George Duron's lovely mom. AND Sally's forthcoming CD, which she will release in January after a December tour of England. Sally's Sixties power pop (with a twinge of punk?) 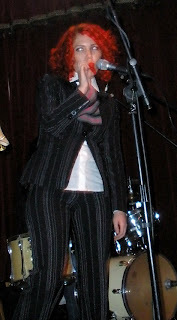 is good stuff, and Sally herself just infects you with her exuberance and energy. Just being around her cures any case of the blahs! Okay, already -- you will have to WAIT for my reviews of all three of these recordings! But you can catch Future Clouds live at Antone's on November 21, Sally at the Mohawk on November 20 (with Golden Bear, Leatherbag, and the eclectic Ethan Azarian), and the Wardrobe on November 28th at Emo's. But why wait for fun? The Breathers (yes, Claire Hamilton sings on the Summer Wardrobe record and actually got on stage at Lovejoys with the band!) have a show at the Continental with Li'l Cap'n Travis and the sultry Hilary York on November 13th. And let it not be missed - The Service Industry has a new record, "Keep the Babies Warm." out November 18. Finally, to the theme of this puzzle -- note the afore-mentioned moms of Sally and George. But today we are talking about Ruby Jane Smith and her enterprising mom Jobelle -- but also about Jobelle's own mom Honey (and her dad, too), whom I met at Waterloo on 38th on Friday at the Ruby Jane Show -- on Honey's actual birthday. We all got a piece of the birthday cake that Jobelle admits not to making herself -- and my Mississippi mother was thrilled to meet people who knew her Jackson so well. Best of all, we got to hear Ruby Jane pick and sing with David Carroll on bass, Marvin Dykhuis on acoustic guitar (is there ANYBODY better? ), and the handsome (just ask Phoebe) Willie Pipkin on electric and acoustic guitar. And, yes, Phoebe herself got on "stage" for a few numbers, notably "Blue Skies." Gotta go -- catch some Z's so I can get out to see Leo Rondeau and Joanna Barbera and HER new band at the Hole in the Wall on Monday! And just remember -- dance like you would if nobody was watching! And, yes, folks, that's A. J. Vincent tickling the ivories at Momo's the other night -- and, yes, I did see some other music that I liked but am not writing about here. Someone Borrowed, and No One Blue! This week's Austin Chronicle features stories on Austin's young musical talent (the under 18 set). Flanfire, meanwhile, has been tracking the career of an even YOUNGER future star, Emme Lou Handal -- and earlier this week the 8 year old singer and actress blew away an audience ostensibly at Stubbs' to hear songs from her mom Tahni's (here on piano, but usually on electric guitar) new CD. Emme Lou, who last summer was a featured performer at the Zachary Scott's Summer Theatre Camp, calmly went back to her normal child's life after her too-short performance -- and yet you can tell from her swagger on stage she's already a pro. Mom Tahni, meanwhile, has a new record -- To Kiss You -- that is the best of the three she has done since moving to Austin with Emme Lou and her faithful dog Annie six years ago (has it been that long?). Her first record, done with Woody Russell, was sweet Americana; her second, produced by Dony Wynn, was dramatic and intense. This record is just first-rate American pop -- produced by Kelly Donnelly (who is currently working with Eric Johnson) and featuring John Lockhart and Bobby Mack on guitars, Stewart Cochran and Mark Goodwin on keyboards, Vance Abeyta and Donnelly on bass, Kevin Hall on drums, and Brian Andrew Lee, Korrinne Billiat, Tina Allen, Mark Chandler, and Jayson Hoyt on backing vocals. Tahni as a teenager was lead guitarist in an all-girl metal band that hung out with the likes of Ratt and Poison (and some bigger names as well). She still has her chops, but left the lead playing at her CD release to Julius Manno (once named Austin's best guitarist by Z-ROCK); Abeyta held down the bass, Cochran was on keys, and Sam Pulley played the drums. "Shooting for the Moon," the first cut, is a remake of an older Tahni song about moving to Austin, but with a new twist. The title track is a gentle ballad about seeking a new and deeper spark in an old flame -- as "I'm running out of time, and I miss you oh so bad, what I wouldn't do to kiss you." "Roll the Dice" is the rockiest cut here -- features a heckuva guitar solo! "Been a loner all my life, that's the way it is...." "For the Last Time" is my favorite (though I also really like "That's Who I Am" and "This Time Around," which reminds me of Pat Benatar). I have to say just how much I like the backing vocals throughout this recording, and here again Tahni has written great vocal arrangements. "I wanna go out with you tonight, I wanna make everything all right ..." This is a great pop rock ballad -- deserves a duet with fellow Italian Jon Bon Jovi or Joe Perry (you get the idea!). [But locally, why not Craig Marshall?] TURN UP THE VOLUME! Maybe Austinites will naturally want to check out "No Work Today" - a catchy tune about a sunny day with clouds that roll on by -- "drive up the coast, wind blows in my hair, if you see me hanging around I'll see you there...." EVERYBODY will want to join in on the chorus! Sheboygan fans will love this music! And then there is "Heartache," another ballad ... reminiscent of a Kacy Crowley tune. The last song, "In the End," was recorded at Church House with Cochran on David Boyle's 1913 baby grand -- this is a lament about a loss of a friend. "You never know what you will get, but if you listen you will find your way ... you never know what you find in your condition, might as well be blind ..."
Jodi Adair flew away from New Caney, Texas, at age 18 and went to Europe, and just kept on traveling. Not that long ago she landed in Austin, to be taken in by such friends as Carolyn Wonderland, Karen Deschamps, Shelley King, and a host of others. Jodi is a singer, a songwriter, an artist and a poet -- and a story teller with a childlike quality and the overflowing love given to her by her man Jesus! I met Jodi months ago, but only recently got to hear her songs -- and find out just how much she is loved by so many of my dear friends. Take Gregory Truett Smith -- whose upcoming project is to paint the Book of Revelation and who has been churning out amazing art for as long as he has had fingers. Flanfire has Smith's Humpty Dumpty in the Southwest on his kitchen wall -- and is in awe of the works he had recently on display at Thunderbird Coffee. One popular piece is the poster art for Carolyn Wonderland's "Miss Understood World Tour" - here she is an angel of light. Another is Courtney Audain, whom Jodi chose to produce her record after hearing what he had done for Steve Carter's wonderful "In Love Again." Then there's my dear friend Kris Brown, on stage on bass, and Cole El-Saleh on keyboards with Carl Ryals on drums. And, who else but Carolyn on trumpet (her new 1920 model), her hand-made mandolin, and of course guitar? Later, the fabulous LZ Love joined in on "Chauffeur Blues," which featured solo verses by all three of these God-loving dynamos. The evening at the Amsterdam (which HAS to be the best new music venue in town!) began with a soaring solo set from Aimee Bobruk, whose bright-eyed mom was in the house shaking a leg and spreading joy all around. Aimee brought lots of energy to her set, including playing to the dozen or so folks sitting outside (through the window glass) in the smoking section. The crowd swelled for Jodi to standing room only -- some had surely come to hear Carolyn play, but this was the newcomer's night -- and the real coming out party for the Amsterdam. You meet Jodi and you feel the love. She reminds me so much of Donna Fargo -- a country girl with a big white Ford truck and an even bigger dog -- but a HUGE heart! So when she opens her set with "Sunshine "Worry 'Bout the Weather)" you feel you are in church (and you are, of course), and then when she continues with "Let Me Love You," the answer is a resounding YES! But back to the record. Jeffery Bouck is on drums, and W. C. Clark gets the lead guitar on "Bad Man Blues." My buddy Oliver Steck blows his horn on "Praise," an honest to God worship song, and Price Porter is on pedal steel on "Daddy Was Gypsy." Otherwise, Carolyn and Kris Brown split electric guitar leads, El-Saleh provides keyboards and even "strings," Audain adds just about everything else, and Jodi provides the songs, the voice, and the joy. 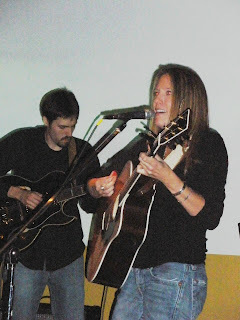 "Devil's Beating His Wife" is just Jodi and her acoustic guitar -- the way she plays Wednesday afternoons 4:30 till 6:30 pm at Mesa Ranch (south) -- and look for Jodi at the Hole in the Wall on Sunday, November 2nd -- a MUST ATTEND SHOW! But back to the show - and the CD. As noted, "Bad Man Blues" is just hot stuff! "Wild Fire" and "Cabin Fever" are songs I will not easily tire of hearing -- "Lessons Rough" is very different from the rest of the record, reminds me of Raina Rose. 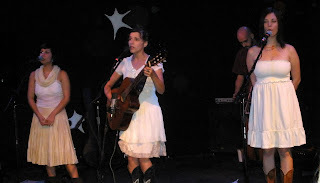 But then "Daddy Was a Gypsy" has that pedal steel and that story about "a pretty Texas queen" who stole daddy's heart and about the girl who also became a gypsy who "settled down easy" after traveling the land -- and yet this is also a song of praise. Indeed, Jodi's myspace moniker is "The American Gypsy." "I Love You More" is an amazing song about faith in the faithless -- shows Jodi's range both vocally and emotionally. Gotta love Cole's piano here (and Courtney's organ adds). "Spoiled Child" is an edgy number -- "what makes you think you matter to me?" "I'm just a spoiled child out there in your world," Jodi sings -- and you know she is being honest even with herself. Now my pal Gregory beamed when Jodi started singing "Big Texas Smith," but I suspect the song is about a blacksmith ... this one features Kris Brown on dobro slide guitar and Jodi's own rough-hewn acoustic guitar and the story of a man whose legend might rival Paul Bunyan or Big John. Earlier in the week I had the great pleasure of watching the wonderful Brennen Leigh, who (with Justin Kolb and Silas Lowe) showcased songs from her upcoming and eagerly awaited CD and maybe a few that will have to wait till her followup record. I stuck around at the Hole in the Wall to catch Shotgun Party on the eve of their world tour of the Eastern United States (boy do we miss those honeys when they are traveling on!). Here's Katy Rose Cox fiddling away as Jenny Parrott (you can see her dress) encourages the band's new bassist Jared Engel (just down from Noo Yawk City!) on his amazing work on their songs! Finally, we have Steve Ulrich and the Djimbe Packers after their wonderful set at Cafe Caffeine on Friday. Steve (Zeus Muldoon, Steve Convenience, and more) was a longtime fixture in the Austin local music scene but he found true love in Guatemala and moved to Portland, Oregon, with his bride Elizabeth and comes back home only once in a while to see his sons and grandkid. Gotta get out to Jovita's on Wednesday for Blues Mafia -- and so much more to do! "Slow Burn" is maybe the most Dwight Yoakum song here, a real honky tonker. And, yes, Bandstanders, you can dance to it. But then, "Lettin Off Steam" is more George Strait -- the boys in the band just lettin' off steam. "Out of My System," cowritten with Matteoli, is the bounciest tune on the record. "Lucy" shows yet another vocal style, closer to Jimmy Buffett (with bongos yet). The final cut, "Live and Breathe," is another traditional ballad, and the more I listen the more I like Minor doing this type of music (kinda like McGuinn with the Byrds singing Dylan). And, as noted, his songwriting provides great opportunities for some of his pals. The third band on the Friday night bill was the Brothers Lazaroff, which still hails from St. Louis even though Brother David has lived in Austin for a number of years. Brother Jeff (the one with the beard THIS week!) 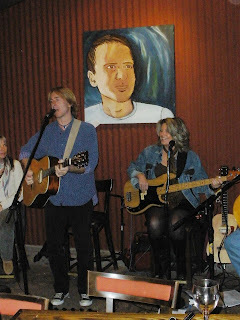 brought down Grover Stewart (drums), Teddy Brookins (bass), and Scott Bryan (guitar) to join Austin's Lindsay Greene (keyboards this time) and Gary Newcomb (pedal steel) -- with Elizabeth McQueen joining in on vocals at their Jo's Sinners Brunch show on Sunday. I LOVE THIS BAND -- and they have just about finished their second CD ... which they will likely debut on their next trip to A-town! Left - Josh Havens of The Afters; right - Juan Gutierrez of The Century at the Hole in the Wall. Earlier at the Hole I caught up with Juan Gutierrez, who played an acoustic set with guitarist David Jimenez (who also sang an amazing version of "Satisfied Mind") and bassist Dan White. Juan handed out a demo with eight songs, including new versions of "Gold Mine" and "Fools Gold." Nice stuff! On Wednesday I got over to the new Mesa Ranch for Happy Hour with Jodi Adair (CD release October 25th at the Amsterdam -- see below -- featuring Carolyn Wonderland on guitar and Kris Brown on bass!) and stuck around for a wonderful set from Jon Emery and Karen Mal (with the amazing Steve Carter sitting in for three songs). I like this venue -- comfortable environs and tasty morsels -- and I was thrilled to see the new, funkier Karen, one of Austin's most beautiful people inside and out. Kim Deschamps is playing Tuesdays at the Amsterdam (8th and Colorado) -- the food is good, the beer is cold (though I had a bottle of wine that evening), and the ambience is Austin! Yup - that's Leeann Atherton blowing the harpoon with Tony Velasco on bass and the very handsome Perry Drake on drums. Finally, kudos again go out to Sideshow Rob Cooperman (the guy needing new jeans) and Monte Peck from Shut Up and Sing -- who ply their trade every Sunday evening at The Dirty Dog and again on Thursdays at Waterloo Ice House at South Park Meadows. These guys are keeping alive that great tradition of song sharing out in public -- and providing really talented people opportunities to make new friends here in Austin. And Oh, Yeah, I ran into Izzy Cox on Sunday at Jo's -- she has another new collection of murder ballads and more about ready for the world -- just got back from another tour and ready to sing her guts out for the folks here in town. A Double Dose of Gentleness: Dana and Eleanor! The Vortex Theatre on Manor Road is one cool venue for music -- even though it is mostly used for live experimental theater. Erika Maassen; Gina Dvorak, Dana Falconberry, and Erika! But Roy Taylor works at the place, and he also produced Dana Falconberry's sparkling new recording, and so several dozen of the luckiest people in town got the chance to hear Dana and her vocal trio (backed by bassist Andrew Bergmann) in extremely fine fashion (yes, Roy also ran the sound and hung the stars and kept the songbirds chirping!). He also manages the band. The glorious night began quietly enough (except for some rustling among the crowd to get another drink during the show, something that would NEVER HAPPEN at the Bugle Boy!). A gushing Erika Maassen (star above her head as it always should be) showed off her pipes with four songs, including Mr. Nothing (which she did not write), then Gina Dvorak followed with five songs that also left most of the audience begging for more. No wonder the three-part harmonies sound so good! Did I mention that all three women came out in white -- and that the entire aura of the evening was much more heavenly than the cream cheese ads featuring silly angels! Dana Falconberry hails from Dearborn, Michigan, but she came to Austin in part by way of Conway, Arkansas, and her songs are often haunting (Doug Burr's songs are a reference here!) and always unique. I have to start with a song that has captured my heart -- "Singing Lullabies" is maybe the most joyful tale of death and afterlife that I can remember ... "Nobody knows that I was singing when I died, and I was peaceful, I said all my goodbyes, and I was happy, I was singing lullabies." The title of the new CD, "Oh Skies of Grey," is the first line in "Blue Umbrella," which on stage often features Erika on cola (or beer) can. Indeed, the musical framing of these songs goes way beyond the lyrics themselves to create a special time. 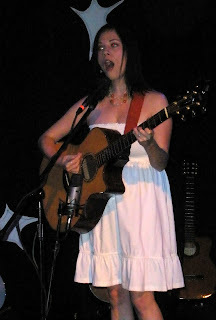 I remember my first encounter with Dana Falconberry -- two Halloweens ago at Epoch Coffee House (outside under the stars) with Bonnie Whitmore all dressed up to play the cello and wearing her roller skates. Sister Eleanor was there that evening, too, with her (then) new BF Chris Masterson. Dana's backing band that evening included Michael Longoria and Luis Guerra (who also play in Terremoto and have Patty Griffin connections), and they of course are all over the new record. Like Seth Walker, Dana seems to have been teleported to Austin from another time -- Seth from the Fifties, Dana maybe from "The Shire." I started going to see Dana at Momo's and thought as I first heard the trio that this was even better than the earlier (for me) stuff and that maybe she could keep this concept going. But would these two very talented women subsume their own individual careers? Not that long afterward, Erika found out her old high school buddy Andrew was moving to Austin -- and that he had become a pretty fair city-slicker bass player. Next thing you know he was a fixture -- and my joy over this wonderful woman and her musical entourage grew again. Back to the live set, which includes Dana playing a very fuzzy electric guitar, Gina picking up the banjo, Erika adding keyboards now and then, plus whistling, tambourines, and more. A major highlight was a hot version of Sam Cooke's "Cupid" -- brought down the house! A favorite of mine has to be "Birthday Song," which I can claim is written to me, as MY birthday is in September, too. But it is songs like "Baby Blue Sky" that remind us that Dana has that amazing quality of making everyone around her feel younger -- and cleaner inside and out. Lucky folks can catch Dana on October 15th at the Mohawk opening for Tom Schraeder -- and again at the Mohawk on November 5th opening for Sea Legs (both CD release shows). 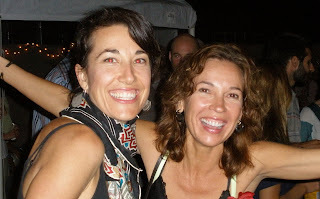 My early memories of Eleanor Whitmore are always as Bonnie's amazing sister who plays fiddle and mandolin -- and how she made Slaid Cleaves a household name for me (along with Oliver Steck). I held Bonnie's hand during Eleanor's dreadlocks days ... and rejoiced when she reemerged from exile in Arlington to pick up not only her fiddle and mandolin but also to go to work here and there for Bruce Robison and Kelly Willis. 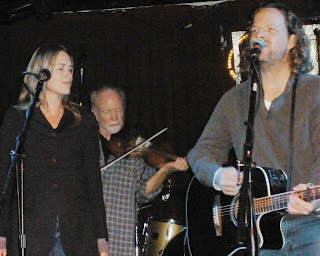 Then I heard that she was singing harmony vocals with Bruce on his new CD -- and so I was excited to get out that cold evening it seems forever ago at the Red Eyed Fly (inside!) to hear Eleanor debut her own songs with sister Bonnie at her side. This, of course, was long after that fateful aforementioned Halloween, so I am certain that SOMEONE was encouraging her to step up. Maybe it was that certain SOMEONE who also was smiling at her as she debuted her guitar picking at Antone's a few weeks later. That SOMEONE (Chris, of course), also produced the new recording, Airplanes (which to me is a counterpart to Dana's Paper Sailboat). I love these songs -- "The River," cowritten with Michael O'Connor (whom I got to know years ago on a big boat with Shelley King and Miss Bonnie and others), "Airplanes," cowritten with Chris Masterson, but particularly songs like "Sing" and "Coffee in the Rain" (so honest!) Maybe the second best thing on the record (besides Eleanor's gentle voice) is Eleanor's heart-warming fiddle (sometimes violin! -- after all she is also a symphony player). Speaking of players, the cast of characters on this recording includes George Reiff on bass, Paul "Falcon" Valdez on drums, Sweney Tidball on piano and Wurlitzer, and maybe a few others whose identities have so far been unrevealed. "Sister Sleeps" is a nice little song that speaks of everyday life when your lover is away. "Waltz of the Mystery Ship" is just a little interlude that sets up "Just Friends" (when she really wants more!) -- subtly subtitled Eleanor ROCKS! "Awake To Remember Me'' really showcases the growth in Eleanor's vocal power -- this song has that Sixties feel (early Airplane?) 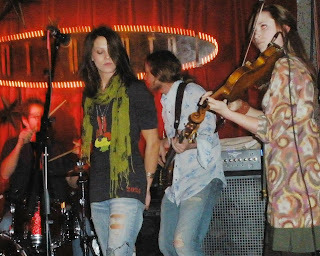 - I hope for a real power solo by Mr. Masterson at the next Eleanor show (which in Austin means opening on October 22 and 23 for Carrie Rodriguez -- yet another fiddle player who can really sing!). I also love "Fly," which is the nearest thing to a traditional top 40 ballad on the record. I can just hear Donna Fargo on this one (if she could handle the subtle political reference). "Sorry" opens with muted trumpets ... OKAY, this too is a real ballad ... that ought to be heard on Majik 95 and other stations that play music for people to really listen to and enjoy. The more I listen, the more I love this song! Even so, "Coffee in the Rain" to me is the purest Eleanor -- I can just see her with her finger properly curled around a fine china coffee cup while wearing cutoff jeans. "Sing" is yet another waltz (with lots of action along the way). And "The River" is ALSO a waltz, but one with that Wimberley touch! Guess I will just have to cough up the big bucks for Carrie (even if I end up missing her set) because I just cannot get enough of Bonnie's Big Sis! Sarah Stollak organized this fine evening of music, in what she has billed as her farewell performances with the Lonesome Heroes and American Graveyard, who shared the stage with the Flatcar Rattlers - and will again on November 15th BTW. LUV Roadhouse Rags! Sarah says that all that fiddling around has just made her crabby and she wants to focus on her jewelry and other handicrafts (she has also been known in this town as Sarah Millenary). We have been blessed in this town to hear Sarah with these two bands plus Marshall Jones and the Frontier Phrenologists and here and there with Girls with Vices and still more performers. I have to say the Heroes show was bittersweet -- Sarah is just tired and may not even realize just how much her music has moved so many of us over the years. Meanwhile, Kullen Fuchs was showing his stuff for a special visitor -- even brought out HIS Wurlitzer piano for the night.